According to Ellis Islan d and the Art Institute of Chicago’s records, Henry Hensche was born February 25,1899 in Germany. 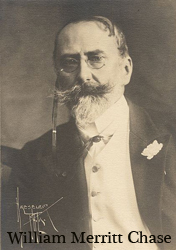 He came to the United States by way of Antwerp, Belgium and arrived March 3, 1909 at Ellis Island aboard the S.S. Kroonland, along with his sister Erna, and his father Fred. Henry was 10 years old. His mother died before he was two. As a painter and teacher of consummate skill, Hens che is considered by many in the art world to be an unparalleled colorist - a painter justly deserving the artistic lineage that extends back just two generations to the seminal American impressionist, William Merritt Chase. He has been called an iconoclast, a pioneer, and the late Grand Central Art Galleries of New York named him, "L'Enfant Terrible de L‘Academie". A teacher for over 60 years, Hensche instilled in his students a profound appreciation for the beauty of nature’s light and color. Between 1922 and 1930 Hensche won the Pulitzer Traveling Prize from Columbia University and the Halgarten Award from the National Academy of Design. He has exhibited at The Art Institute of Chicago, The Corcoran, The Pennsylvania Academy of Fine Arts, and has had many other one-man-shows. He is listed in Who's Who in American Art. Some of his students who have gone on to become nationally successful painters are William Draper, Franz Kline, and Nelson Shanks. 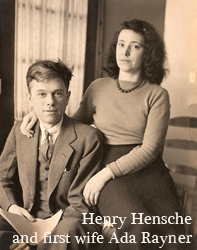 Living with his father and step-mother in Chicago, Henry Hensche worked in the stock yards to earn the money that would send him to The Art Institute of Chicago. There he studied with George Bellows. Hensche studied drawing, painting, and figurative sculpture with all the thoroughness and depth that was expected of an art student in the early days of the twentieth century, eventually attending the National Academy of Fine Arts, the Art Student's League of New York, and the Beaux Arts Institute of Design. But in 1919, in Provincetown, MA, it was at Charles Webster Hawthorne's Cape Cod School of Art that Hensche found his home and true calling. In 1896 Charles Hawthorne became assistant instructor to William Merritt Chase at his Shinnecock, Long Island outdoor painting school where the lessons of the French Impressionists were first brought to American shores. In 1899 Hawthorne opened his own outdoor school in Provincetown, MA - the Cape Cod School of Art - the first school to teach outdoor figure painting. By 1915 Provincetown would grow into one of the largest art colonies in the world, attracting such luminaries as Childe Hassam, William Paxton, and Ernest Lawson. Artists who sought Hawthorne’s instruction included Emile Gruppe, Norman Rockwell, Max Bohm and Richard Miller. As a young student at the Art Institute of Chicago, Henry was enthralled with the strong, virile color in paintings done by some of his fellow students who had studied with Hawthorne in Provincetown during the summer break. Henry was 20 years old when he arrived at the Cape Cod School of Art, and he soon came to revere Hawthorne as a father figure. In 1928 Hensche became Hawthorne’s teaching assistant. He is listed in the 1929 brochure for the school - two critiques by Henry Hensche, Monday and Thursday - and a demonstration painting by Hawthorne on Friday morning, followed by a weekly critique on Saturday. The whole summer session lasted eight weeks and the cost was $50.00 for the season. Hensche painted in the tonal academic tradition of the times, however, his continued study of light and color slowly gave way to paintings of breath-taking beauty. Many painters of Henry’s generation were influenced by the strong currents of Modernism that emanated like a shockwave from the Armory Show of 1913. Though initially intrigued with the shifting fashions of the art scene that predominated in New York at the time, Hensche came to see the history of painting as an ongoing development in the progression of man’s visual vocabulary. Some of his first figure paintings had a narrative element similar to the Ashcan School, derived somewhat from Hawthorne’s portrayal of the working Provincetown fishermen and their families, but early on the poetic character of light and color emerged as the twin themes that would guide his painting throughout his life. As he told Robert Brown in a 1971 interview for the Archives of American Art, “Paintings are to teach man to see the glory of human visual existence”. For him art was, “…the arrangement of truth”. Hawthorne pointed the way to a greater realizatio n of color in realistic painting yet it was for his student, Henry Hensche, to bring to fruition a complete transition from tone-based painting to paintings revealing the full spectrum of color. In 1930 Henry met Ada Rayner, a Londoner who came to the United States in 1929 to escape what she thought was the repressive caste system of an old world. Ada built her home in Provincetown on 12 Conwell St. Hensche often referred to her as his best student, and she’s remembered for her outdoor floral still life paintings. They married in 1936. During the off-seasons Hensche painted and became a sought-after lecturer and demonstrator across the United States, traveling to California, Oklahoma, Richmond, and Louisiana. In 1974 Henry began teaching during the winter months at Studio One in Gray Louisiana, an art school maintained by Dotty Billiu. Ada Rayner Hensche passed away in 1985. In the late’80s Hensche married Dotty Billiu and for a short time continued living summers in Provincetown and winters in Louisiana. Eventually Henry and Dotty moved to Louisiana for good. Henry continued to paint and teach at Studio One until 1991. Henry Hensche died in Louisiana on December 10, 1992 from Parkinsonism.